2018 marked the 10th Annual non-motorized Monster March Parade in Elora, where everyone is invited to create a costume, push a float, ride their wagon, bring the dog and take part! This free family event has become an October institution in Elora and, for our 10th anniversary we added rappeling from the Bell Tower of One Axe Pursuits to start the parade as well as additional entertainment at the end of the parade in Bissell Park. We intend to continue to expanding in 2019 and beyond. We encourage all individuals and groups to take part. Please keep it family friendly as we invite all ages to walk with us or watch from the sidelines! "TuTu in You" volunteers will be collecting donations to the Centre Wellington Foodbank along the parade route, please be generous. Tim Murton's Twilight Zoo monsters have been decorating the streets (and parks) of Elora each October for over a decade. Each year, Tim adds to his menagerie with the help of volunteers who help to add the "skin" to the creations. Featured on Martha Stewarts Halloween Special in 2011, these wire and paper sculptures attract visitors from far and wide to visit Elora's famous Monster Month. 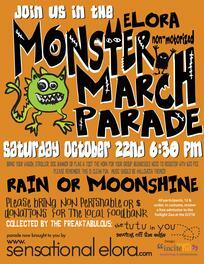 This year, the Monster March Parade will end at Bissell Park where we will be serving free drinks and snacks. We encourage all parade participants to wear your best halloween costume. Please visit http://monstermonth.ca/ to see some fabulous costumes from previous years.